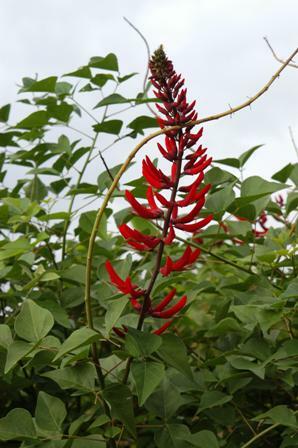 HABIT: Large-growing, deciduous, perennial that blooms spring till fall with dark red waxy flowers on spikes up to one foot long. Thin dark pods about 8 inches long open to expose brilliant red (poisonous) seeds. Trunk and branches have stout, curved thorns. Compound leaves made up of three leaflets that are uniquely shaped with pointed tips and a bulge in the middle. Coral bean is very cold tender and at 28 degrees F will die back to the roots like a perennial, normally returning in the spring. The roots are hardy through zone 7. In the Rio Grande Valley and other warm areas it loses its leaves but does not die back and can grow to be a small tree ranging from 6 to 25 feet high. It grows along the U.S. southeast coastal plains and in East Texas in sandy open woods and can adapt to clay and other soils. USE: Interesting texture, summer color, attracting hummingbirds and beneficial insects. A good choice for hot, sunny sites. CULTURE: Easy to grow in most soils in sun to partial sun. Likes neutral to alkaline soils best. Be careful of the spines on the stems. Moderately drought tolerant once established and grows best in well-drained soil. NOTES: Can be used as an annual in colder climates. Seeds are poisonous to humans if eaten. Sensitivity varies with a person’s age, weight, physical condition, and individual susceptibility. Children are most vulnerable because of their curiosity and small size. Toxicity can vary according to climate, the plant’s different parts, and its stage of growth. These plants can absorb toxic substances, such as herbicides, pesticides, and pollutants from the water, air and soil.